Adult Stem Cells Help Spinal Cord Injuries .. Paralyzed from the Waist Down! Jeni Rummelt always wanted to run a fitness club, so she opened Solid Impact Fitness with her husband in 2001. "This was my dream and two months later I'm like 'ok, I can't use any of this now," said Rummelt after a car accident left her paralyzed from the waist down. "My family and I were in Iowa and we were hit head on. Somebody crossed over the median of I-80 and hit us head on. My first thought is 'Oh my gosh', there went my house, and my business and I don't know what's going to happen with my marriage." Nearly six years later, the dream business is thriving and Jeni's marriage to Trent is strong, she's even had two kids since her accident. Rummelt now has a new dream, something that used to come naturally. "It is my belief that I will walk again." The first step, a trip to Moscow, Russia. For a procedure not available in the USA - adult stem cell therapy at the Neurovita Clinic. "The give you shots for four days on the 5th day what those shots have done is make your bone marrow create an abundance of stem cells." The stem cells are drawn from Rummelt's own blood and separated in a special machine. Then they are injected into her spinal fluid. Three trips and six injections later Rummelt can use her hip-flexers to crawl. A considerable feat, after not being able to move the lower half of her body for years. "I had no feeling, no sensation, if my leg fell I had no idea at all," said Rummelt. With therapy Rummelt grows stronger everyday she can even stand. And she can actually feel pain in her foot, five years post injury. Rummelt credits the stem cell injections and her intense physical therapy. "Every other week, something is getting stronger or I'm feeling something different, or a little bit more." Even the slightest change makes her push harder. And hopefully with more stem cell injections Rummelt can finally get back on her feet. "Nothing is going to stand in my way, I'm going to keep trying." Research and applications involving adult stem cells do not get the same attention that is given to mere speculation concerning the potential of embryo destroying stem cell research. Why? 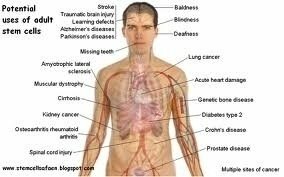 What about using our own STEM CELLS to repair and rebuild your bodies. What media news stories have we heard about Patent STEM CELL Enhancers ..
Help for Quadriplegic and Paraplegic patients...“Spinal Cord Break means the victim will never move a lower muscle or even feel below the waist again.” That was true in the year 2000. But by 2002, a Portuguese neurologist proved otherwise---and quite decisively, according to Don Margolis. Dr. Carlos Lima of Portugal discovered that he can extract Repair(Adult) Stem Cells with renewable neurons from the NOSE of the patient! Those are VITAL for repairing the devastating nerve damage done when a spinal cord is severed. Dr. Lima implants these very special Repair Stem Cells directly to the area of the break. Listen as Don Margolis tells in the video below, how Adult Stem Cells, aka, Repair Stem Cells, can help spinal cord injuries including Quadriplegic patients .. plus over 100 diseases and injuries. Watch VIDEO Below .. Doctors Told These Spinal Cord Injury Patients They Would NEVER WALK Again .. Adult Stem Cells DO Help Paralyzed Patients .. Kit Bond, a spinal cord injury patient, is reporting that multiple stem cell treatments in Portugal and China have improved his quality of life and that is the reason he continues to go to receive Repair Stem Cells (aka Adult Stem Cells). Bond was the 54th person in the world to have the procedure done. Although he knew it was risky, he said it was worth it. Immediately after the surgery, Bond’s body regained the ability to regulate temperature. Before that moment, Bond had a problem where he always felt cold — a common problem among quadriplegic patients. Later after a year of rehab and school, Bond went for another stem cell therapy in China in May, 2008, this time he received adult stem cells taken from donated umbilical cord blood (not embryonic stem cells). And how did the treatment work for his spinal cord injury this time? Let's ask his physical therapist, who had worked with many SCI and quadriplegic patients: Trey Ratzlaff, a physical therapist assistant at Stillwater Medical Center’s Total Health, has worked with Bond since before he started the stem cell treatments. Ratzlaff said after Bond’s first trip to China, he was convinced the treatments were working after Bond came in for therapy for the first time after returning. The first two stem cell therapies worked, so why not go for 3? That's exactly what Bond did. He went for a third stem cell treatment in China in May 2009. Bond’s next trip to China was May 2009 where he received six injections. Bond said he has gained a lot more independence and strength in his core and his arms thanks to the stem cell injections. However, the treatments definitely come with a monetary cost health insurance doesn’t cover. Many quadriplegic and paraplegic victims have limited funds and depend on various resources to raise money needed. Danny Harvey, Bond’s stepfather, said the treatments, plane tickets for Bond and his family, lodging and food along with other miscellaneous costs total between $45,000 and $50,000 per trip. But Harvey said he doesn’t mind the cost because of the benefits for his son. After each treatment, Bond is always in an even better mood and his independence increases, Harvey said. “We wouldn’t keep doing it if there weren’t some kinds of signs,” he said. Harvey is NOT skeptical the stem cell treatments are working on quadriplegic victims and other Spinal cord injury patients. Harvey said Bond’s siblings have noticed improvements in their brother, as well. If you are a quadriplegic or paraplegic victim ,why should you consider going Overseas for Treatment? Well, I'm sure Bond and his family would rather not shell out $45,000 for the therapy and expenses every time they leave the country for Repair Stem Cells, but Bond does not have an option as Adult Stem Cells aren't available in the United States. Why isn't it available? The FDA has handcuffed progress on treatment advances using adult stem cells by treating your own cells the same as a new drug. This is Not saying that they are a miracle cure for spinal cord and quadriplegic victims, but stem cell therapy is a very safe procedure with no side effects so why the FDA doesn't make it available? Fact: Adult Stem Cells ( aka.. Repair Stem Cells )have been successfully for helping quadriplegic victims and for all Spinal Cord Injuries .. Investigate all your Stem Cell Options .. including Stem Cell Nutrition, which can release Millions More of YOUR OWN Adult Stem Cells within minutes of consuming 2 capsules. Nearly 300,000 people in the U.S. are living with a spinal cord injury. Every year 12,000 people ( many are quadriplegic patients) are told they'll never walk again after an accident. What if one injection of stem cells could pump new movement and new hope into a paralyzed body of a quadriplegic patient? A scientist who's spent the past decade in the lab looking for a cure said a new treatment is within reach. If he's right, it could revolutionize the treatment of spinal cord injuries. "I was just playing beach volleyball and I ran into the ocean for a swim to cool off, dove into a wave and hit a sandbar and was instantly paralyzed," said Janne Kouri, a spinal cord injury patient. What started out as a day on the beach ended up changing the future of the 31-year-old In a University of California, Irvine lab not far away from where Kouri's accident happened, researcher Hans Keirstead said he may hold the key to helping spinal cord injury patients re-gain movement. "This treatment, I designed for individuals within two weeks of their injury, so it's a scary thought that those individuals that will receive this trial haven't even been injured yet," said Keirstead. Keirstead took human embryonic stem cells and coaxed them into becoming spinal cord cells, then he injected the concoction into rats. The new cells traveled to the damaged spinal cord and wrapped themselves around the nerves, restoring function. In six weeks, the previously paralyzed rats walked. Keirstead said human trials could start later this year. About 10 patients will get an injection of cells directly into their spinal cords. The hope is to see small movements with three months. "This is going to be an incremental advance," said Keirstead. Since this is the first trial of its kind, there are still a lot of unknowns. Will the stem cells work as well in people as in animals? Will there be side effects? "One day there will be a cure," said Kouri. Kouri is too late for this trial, but could be a candidate for Keirstead's next experiment, using stem cells to help those who've been injured years ago. "Once they figure out a solution, we want to be in the best possible shape you can be in," said Kouri. Some critics said they believe Keirstead is pushing this treatment on people too quickly, but when it does enter human trials, it will be regulated by the FDA. Keirstead said he realizes there's a chance it won't work. Two-thirds of new treatments never make it out of the second phase of testing. FIRST IN THE FIELD: Nothing motivates Keirstead more than the pleas from quadriplegic victims in the paralyzed community. "The patient community screams, 'Please develop treatments. We want them now. Choose me, not the rat,'" said Keirstead. In his lab at the University of California, Irvine, Keirstead is making strides in developing a treatment for spinal cord injuries and add to the renewed hope of all paraplegic and quadriplegic patients. Keirstead, a professor of anatomy and neurobiology at UC Irvine, developed a very high purity concoction of stem cells made from human embryonic stem cells and injected the mixture into the spines of paralyzed rats. The new cells he created traveled throughout the spinal cord area and wrapped themselves around nerves, enabling signals to once again flow through the body. In six weeks, the once paralyzed animals walked. "My lab was the first lab in the world to take stem cells that can make any cell in the body and trick them to become one thing only: a high purity population of one particular spinal cord cell type," said Keirstead "That's important for human application: You can't put toenails in the spinal cord." Later this year, Keirstead hopes to start human trials. The experiment, which would be regulated by the FDA, will involve about 10 spinal cord injury patients. They will be people who have suffered an injury within the past two weeks. Doctors will inject the high purity stem cell directly into the spine, and the hope is that the patients will show subtle movements within three months. "It would be wonderful for these quadriplegic and paraplegic patients to get out of their wheelchairs and play soccer, but we do not, let me be clear, we do not expect that to happen with this treatment," said Keirstead. "This is going to be an incremental advance." Scientists don't yet know if embryonic stem cells will integrate and function in the body as well as they did in animals. There's also a fear of side effects, including the stem cells possibly forming abnormal cells or tumors. However, there is currently no other treatment to help SCI patients, and Keirstead said he believes this could be a huge step in helping these patients regain some movement. "An incremental benefit is a huge deal for someone in a wheelchair," said Keirstead. "The ability to take the thumb muscle and move it if one can't move it is tremendous." Keirstead is overseeing several other experiments involving stem cells in his lab. Within the next one to two years, he hopes to start trials for people who suffered spinal cord injuries ( including quadriplegic victims ) years ago. He's also working on a stem cell experiment to help babies with spinal muscular atrophy, or SMA, the number one genetic killer of infants. BACKGROUND: National statistics show 12,000 people suffer a spinal cord injury (SCI) every year, and currently about 300,000 people are living with SCI. SCI primarily affects young adult men. Currently, more than 80 percent of spinal cord injuries,including quadriplegic victims, occur among men. Experts hypothesize that men are more likely to engage in risky behavior that results in injury. Since 2005, car crashes account for more than 40 percent of SCI cases. The next most common cause is falls, followed by acts of violence (primarily gunshot wounds) and recreational sporting activities. These published material of quadriplegic and spinal cord injuries , including articles, products, statements, testimonials, reviews, and videos, have not been evaluated by the Food and Drug Administration. They are for educational and informational purposes only and do not constitute medical advice. The opinions expressed herein are those of the authors and ANY products mentioned or referenced,are not intended to diagnose, treat, cure or prevent ANY disease or illness.